Since having two babies of our own, I have been shocked how parenting techniques can be such dividing factor among friends. This is so sad to me. 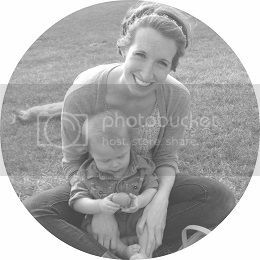 I honestly believe that all parents -- as a general rule -- love their babies so much and are only doing the best by them that they know how. Each child is different, each family's situation is different and so each approach will be different and that's really okay. 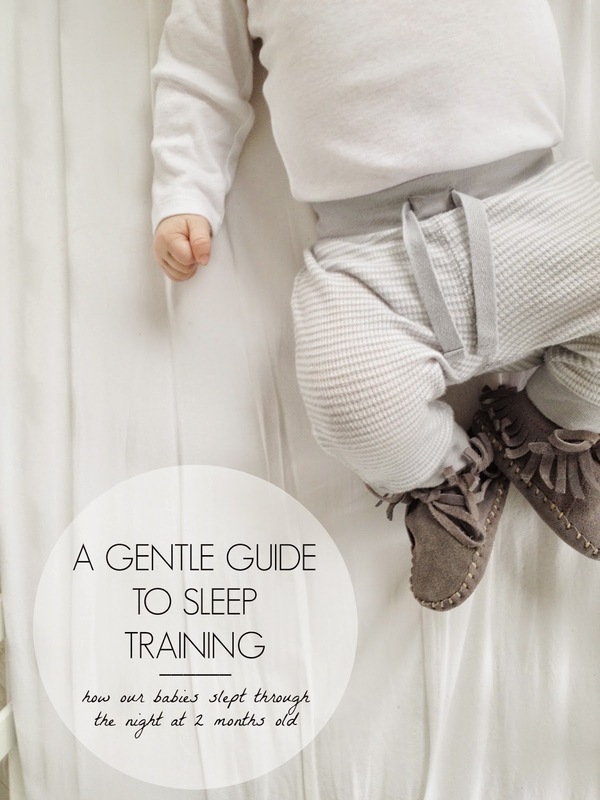 I also know that I always love learning little tips and tricks to better care and raise our babies, so I thought it would be fun to share a few things that have worked for our family with teaching Emmett and Gideon to sleep well at night. I want to caveat what I am about to share with this. I know that the phrase 'sleep training' has been abused in so many ways so it often causes parents' neck hair to raise. That's why I call these steps to gentle sleep training. I remember reading in one of our favorite books, that babies have to be taught how to do everything. Eating, sleeping, playing, walking, talking, reading, riding a bike, and on and on. So rather than the idea of throwing my baby in his cradle, walking away and expecting him to learn to sleep, I love the mental picture of loving teaching my baby how to sleep and rest well. This feels so tender and caring. I also know that everyone's situation and personality is different so what works for us, may not work for you and that is okay. I only share these tips for those who may be looking for a different way to do naps and bedtime. Just know that I don't judge anyone for the way they choose to approach this part of parenting and I hope you can do the same for me. So without any further ado, here are a few things that have helped us in teaching our little guys to sleep well at night. We have found by consistently doing these things, both Emmett and Gideon were sleeping 6-8 hour stretches by 2 months old. Of course their sleep patterns continue to ebb and flow as we travel, battle sickness or hit growth spurts. But overall, they have become great sleepers and we are so grateful for that! This one is huge. Right after the boys were born, I began to work towards getting them on a 2 1/2 - 3 hour feeding schedule. Each day might look a little different and I was able to adjust it depending on our family's schedule, but I was always shooting for full feedings every 3 hours. This enabled them to fill their little bellies throughout the day and access the hind milk // read more on this here // which will fill them up and keep them from just snacking throughout the day. When babies have complete feedings routinely each day to really fill up and be ready to sleep longer stretches at night. We all have things that we associate with sleep and babies are especially this way. For some this may be nursing to sleep, pacifiers, motion, etc. It's been really fun because with Gideon especially we have seen the power of positive sleep associations. From his first day, we would run a white noise machine and/or fan when it was nap and bedtime. We also swaddle him when we are home and he sleeps in his bed. Lastly, I will usually put a little bit of coconut and lavender essential oil on his little forehead and cheeks to help soothe him to sleep. It's amazing how upon doing those three things, his eyes will immediately get heavy and he is headed right off to sleep. This is our favorite white noise app and this is the highest quality of lavender essential oil that we use on our babies. Not only is this great for naps and bedtime at home, but when we are out running errands and Gideon starts fussing because he is tired, it only takes turning on the noise app on my phone for a few minutes and he is out. It's hilarious to watch because he calms down so drastically!! I know this one can be a bit controversial and that's too bad. If you decide that rocking or nursing your baby to sleep is the path you want to take, awesome! But if you want to set up the habit of your baby learning to fall asleep on his own, then this little tip is for you. If babies can learn to lie down in bed while drowsy, but not quiet asleep, it will set them up with a great habit of knowing how to fall asleep on their own. This has been invaluable to us because it means that every nap and bedtime, we aren't tethered to the room until Gideon falls into a deep sleep. I always swaddle him up, rub on some lavender oil and then sing and cuddle him until his eyes get heavy. Then before he falls fast asleep, I slip him into his cradle. Again, not everyone wants to do this but for us, it works great! 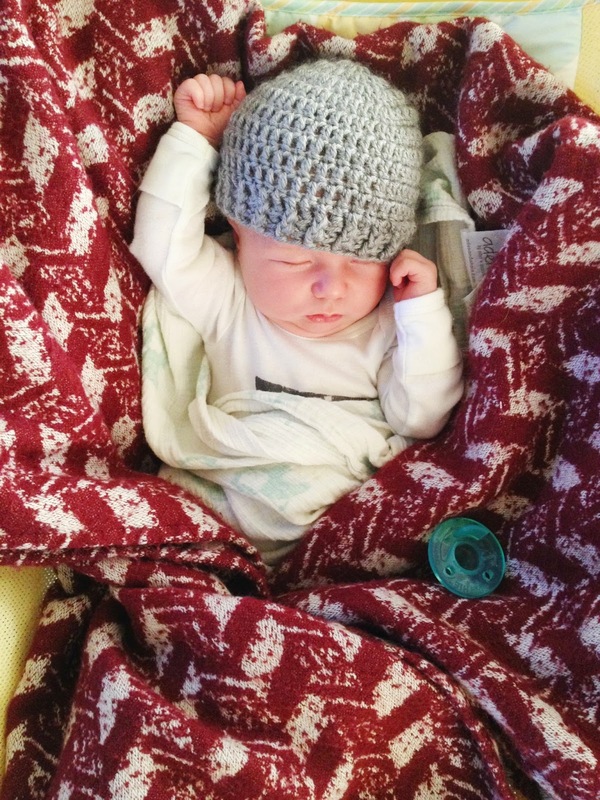 When Gideon was about 6 weeks old, he had a night when he slept from 11 to 6 the next morning. Ahhh! After waking for 6 weeks of night feedings, it was SOOO nice to have that long stretch of unbroken sleep. And all the postpartum mamas said Amen!! It also helped me to know that his little body was physically able to make it that many hours without food. The following week, he went back waking each night around 4:00. Around 7 weeks, I decided to see if I could gently help him to fall back to sleep for a little longer. Sometimes babies' body clock can get set to waking at a certain hour to feed, even if they physically aren't needing a midnight meal. The next night, I decided that when he woke at 4:00, I would pick him up and try to sooth him back to sleep rather than offering him milk right away. It took a little while, but eventually with some cuddling and walking around our darkened bedroom, he drifted back to sleep. Within a few nights, he was officially sleeping for 6-8 hours and his body clock was reset! The great thing is that he didn't have to cry or be alone. I was right there, gently teaching him to put himself back to sleep. Of course, on the nights he seemed really hungry I would definitely feed him, but this gave him a chance to fall back to sleep in a peaceful way. Again. . . please know that the purpose of this post is not to say our way is the best. Rather I love passing on little things that we have found helpful and I am always looking to learn from others as well. What things have you found helpful with babies and sleeping?! Also for more on this subject, I cannot recommend this book enough: Cherish The First Six Weeks //affiliate link included// Many of these tips and philosophy has come from reading and putting her wonderful wisdom into practice! First off, let me sat that your photos are absolutely beautiful. If I'm a bit honest, they distracted me form the post! Gorgeous! My kids are grown but man what I wouldn't have done to have these tips back then! Great ideas! thanks for your kind words. they mean SO much. i was a little nervous to post this because i know sleep and babies is such a hotly controversial topic. your support means the world. it's crazy how controversial sleep is. I think because it is such a daily battle and so much energy and time getting your babies to sleep! but i love your sweet words of saying this is what worked for you and your babies! like i mentioned, i swaddle, cuddle, sing, lavender-up ;) and rock a little. then when i notice his eyes getting heavy and just about to drift off to sleep, i gently lay him in his cradle. sometimes he might squirm a little bit but the book that book that i mentioned at the end of the post -- i actually just added it because it's such a greater resource than this little bit i posted -- suggests that if they are whimpering or squirming around, count to 10 silently before picking them up. i have noticed that sometimes gideon will wiggle back and forth and make little noises and THEN falls to sleep. if i am constantly picking him up at the first sound, he never has the chance to learn how to fall asleep. if he doesn't seem to be settling after that, then i might try to pat him, shush, etc. if that doesn't work, i will pick him up and start the process over. honestly there were nights in the beginning when i would do this whole little song and dance 3-5 times before he finally fell asleep. but eventually he would go to sleep. of course there are nights when he is so worked up or overly tired so he can't settle at all. on those nights/naps, i will rock him to sleep. there are always exceptions to every rule and i want to show him and myself grace. the main thing i go for is to be putting him down drowsy more often than not. does that make sense? when he is very little -- the first 2ish months -- i never let him cry it out! i believe they are way too tiny for that in my opinion and it breaks my heart. ;) according to the book, it's not good for them developmentally. but as he has gotten older, i will let him cry a little bit more. for example, around 3 months or so, as he hits different growth spurts or sleep regressions, he will go through phases of not going to sleep as well, then we might let him fuss for 1-2 minutes before picking him up and starting the process over again. as he gets a few months older, we might let him fuss/cry for 3-5 minutes. of course i am always right there -- usually around the corner or other side of the room. i hate the idea of sleep training where you shut the baby in the room and walk away. i love being right there monitoring him and making sure he is okay. more often than not, he will go to sleep before a few minutes are up. okay. this is a book. haha. ;) just remember the end game. if you are able to do this consistently i promise it will pay off. i remember when i hit that time right around 2 months when i tried to help him break that body clock issue at 4am, i told myself that i would have to work with him for a week before i saw any results. that way i wasn't so frustrated when i was up walking the floor with him in the middle of the night. i was shocked when two nights in, he slept through the night. again, every baby is different but the principles tend to be the same. I have been so hurt/blown away/confused by how divided people are in these different areas. It is hard to pick and choose what works for you since it seem to either violates one method or another and earns you sniffs and loaded questions. Most of your tips I learned by trail and error trying to balance different methods and have been the most helpful for me. I'm "pocketing" this post for whenever another little baby joins our house. I feel like I wasn't very proactive in the sleeping-through-the-night soon enough and endured 18 months of not getting a full night's sleep. Maybe I can someday have a second chance.